An oil tank for Harley Davidson, developed by the Carley Foundry Inc. in Blaine, MN, was named as the winning product. The product houses and circulates oil across the new Harley Rocker’s operating system, and it is a critical element of the cycle’s cosmetic look. The product was cast in A356-T6 aluminum using semi-permanent molding and weighs 9.25 lbs. In addition to its aesthetically pleasing design, it provides superior heat resistance than the available options – a plastic design and a multi-piece fabrication. A division of Marathon Automotive Group, Contech U.S., won two awards in the 2008 International Aluminum Die Casting Competition, sponsored by the North American Die Casting Association. It is an annual competition that acknowledges outstanding castings depending on their design, effectiveness, cost savings, ingenuity, innovation, and the potential to change industry trends. A rear knuckle component for the Jaguar XK8 was named the winner of Aluminum, Squeeze/ Semi-Solid award. It was a large, complex component designed using Contech’s P2000 squeeze casting method. This is the 3rd consecutive year that Contech has won the award in this category, and the 5th time since 2001. It won the 2nd award under the “Aluminum Casting under 1 lb.” category, for a rear-axle thrust rod designed for the BMW X5. Fully designed by Contech, the rod replaced a multiple-part steel assembly and provided about 50 % weight savings for the automaker. This is a material handling steering / linkage assembly designed by the Piad Precision Casting Corp The component is a brass permanent-mold chill casting, which replaced a weldment that comprises of ten pre-fabricated pieces, nineteen weld joints, and four bushings. CNM Iron Castings has developed this agri-speed hitch, which is an assembly of austempered ductile iron and ductile-iron green sand castings, which was reverse-engineered from the customer’s weldment. The component has resulted in reduction of 30% in weight and 40% in cost. This is a 124-lb. white iron no-bake sand casting, designed by the Castalloy Corp. for use as a static mixer tube. Conversion from a 7 piece fabrication, the component eliminates all assembly labor and allows the designers to incorporate strategic thickening of wear areas. Designed by Denison Industries, this is a main transmission housing for a military contract, transforming a multi-piece assembly into a 200-lb casting. The component is designed using A356-T71 aluminum no-bake sand that eliminates tubing, hydraulic lines, and passageways. This is a 21-lb multifunction bracket/towing eye designed for Volvo by Citation Columbiana. 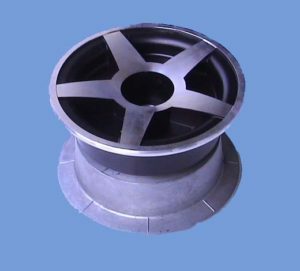 Developed using ductile-iron lost-foam casting process, the component eliminates the machining and heat treating required on earlier bracket designs. Developed by General Motors & Diversified Machine, this component is a 33.5-lb. vacuum riserless/ pressure riserless casting designed to serve as an engine cradle for the Cadillac CTS. The casting was poured in A356 aluminum and welded to 4 aluminum extrusions to create the engine cradle. This is an automotive aftermarket intake manifold designed by the Trilore Technologies. The component is a 13-lb. A356-T6 aluminum casting, converted from a plastic molding. Eck Industries make use of the ablation process to design this 4.9-lb, A356-T6 aluminum rear motorcycle frame. The component provides improved mechanical properties in its thin sections. For more articles related to metal casting and manufacturing technology, log on to A reliable source of vast information on die casting, http://www.aluminum-casting.org/- A graduate in mechanical and materials engineering with about 12 years experience in manufacturing industry, including – tooling design, casting methods, cast product design, machining initialization, and manufacturing techniques. Garry has expertise in metal casting, including centrifugal casting, die casting, permanent mold casting, sand casting, and investment casting.